Yeah, we're just cool like that. We hire sitters and go out to dinner DOWNTOWN. We sit in a trendy restaurant and talk about Bella the entire time. We wait in line at the Target Center to get patted down. 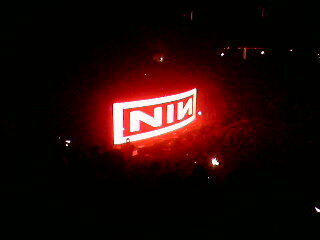 We rock out to Boris (opener) and NIN. Kind of surreal after my morning spent at Madagascar 2. And Bella throwing up in the van on the way home.